And ARRB’s crack Transport Safety team is happy to be doing its bit. The Major Road Projects Victoria (MRPV) engaged ARRB to undertake Safe System Assessments of reference designs for projects in the Northern and South-Eastern Suburban Roads Upgrade packages. For this project, Safe System Assessments are being undertaken for each project reference design to ascertain a baseline level of safety. This will enable a quantitative safety assessment to be undertaken of concept designs received by MPRV against the reference designs. Our Innovation Lab at the National Transport Research Centre in Melbourne has become the nerve centre of this project, with an extraordinary level of detail involved in the process we undertake. 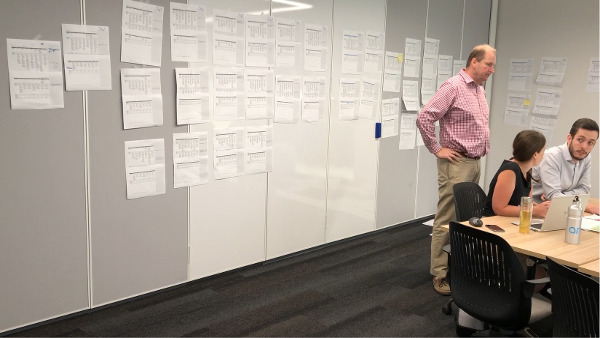 You can see the level of detail captured in this video, where ARRB's Transport Safety team of Blair Turner (standing), Lisa Steinmetz and Brayden Capper brainstorm the project. Some of Melbourne’s key roads, like Fitzsimons Lane through Eltham and Templestowe, Epping Road in Melbourne’s north, and Narre Warren-Cranbourne Road are part of our work. The Safe System Assessment Framework is a practitioner assessment tool to assist in the methodical consideration of Safe System objectives in road infrastructure projects. The tool was developed by ARRB for Austroads (in 2016) to ensure Safe System objectives are being met for road infrastructure projects. The underlying principle of the Safe System is that humans are fallible, and sooner or later mistakes (and hence crashes) will happen. When they do, the system should be designed so as that a fatal or serious injury outcome does not occur.